Cherry Hill resident Bruce A. Apple of Apple Physical Therapy recently lived out his childhood dream of becoming a major league baseball player. “It was so much better than what I expected,” said Apple after returning in late January from a weeklong trip to Tampa where he attended the New York Yankees Fantasy Baseball Camp at the George M. Steinbrenner Field. More than 100 men from across the country, many from New York; some from as far as Australia, age 21 through 70 and beyond, were given the official pin stripes with a self-chosen number on the back. They changed in the same locker room as the pros do during spring training and then — divided into teams of 12 and 13 — flocked to the fields to play daily double headers. Warm ups and drills were led by Yankee greats who also served as team coaches. They included Oscar Gamble, Mickey Rivers, Bucky Dent, Al Downing, Ron Blomberg, Gil Patterson, Orlando “El Duque” Hernández, Jim Leyritz and Jesse Barfield. 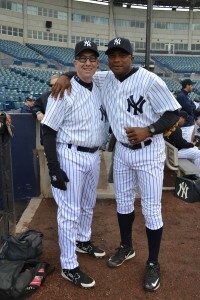 Besides the camaraderie that developed with other lifelong fans and former players, highlights of Apple’s week included donning the Yankees uniform for the first time inside the official team clubhouse and walking onto the field to face the “Greats” during two innings of memorable baseball. Apple played third base and cleanly fielded a hard hit grounder off the bat of Jesse Barfield.